The ebook is not fitting right, it flows off the right side. The "next page" arrow is barely there. And then the text flows over the top of the header. It ends up blocking the arrow. But I have noticed something that helps when viewing a VitalSource book on the 1st-gen iPad (this is what I have too!). When you view a VitalSource book, there is usually a vertical grey bar on the left-side that separates the table of contents from the page content. If you click this bar it should open / close the table of contents. I've found that if you open and then close the ToC this often fixes the display of left/right arrows in the page itself. You may want to give this a try. Also, VitalSource makes a native iOS app (called VitalSource BookShelf, free in the app store) that will allow you to download the full book and read it even when you are offline. 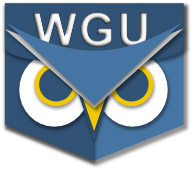 PocketWGU can't link to this app, but you will probably find that using the VitalSource app for reading their books is much easier. I do recommend giving that a try. OK, that all makes sense! Thanks for taking the time to type all that! I did have the VitalBook app at one time. I will grab it again, since I am sure my first-gen iPad won't be upgraded anytime soon. "...I am sure my first-gen iPad won't be upgraded anytime soon." I definitely get that. My iPad is also first-gen, and considering how expensive they are, I can't see getting another while this one still works. This is why I try to keep PocketWGU backwards-compatible as long as possible; something that's not as easy to do as it should be. Supporting older versions of iOS adds complexity to the PocketWGU code and each new version of iOS offers features that I might like to use but often can't (Apple rarely makes any new OS feature backwards compatible). I'll hold out as long as I can, but eventually I'll have to drop support for iOS 5 (as I did for iOS 4 earlier this year) so that I can continue to improve the app.